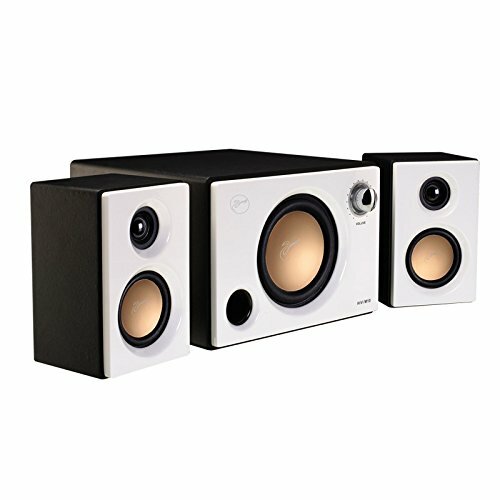 Classy black and white 2.1 high-end multimedia speaker system designed for music, gaming, and movies. The classy black and white casing makes the Swans M10 a truly vogue product. Swans M10 adopts acoustic friendly real wood enclosure, keeping resonance to a minimum. Whether connected to your PC as a stand alone speaker or to your iPhone / iPod as a portable speaker, the M10 delivers impressive sound quality. The Swans M10 is a 3 way 2.1 channel multimedia speaker system. The satellite speaker is composed of a 3” midrange-woofer coupled with natural fiber soft dome tweeter that are responsible for the 120Hz - 20kHz frequency range. To complete the set, a separate 5” long excursion subwoofer with specially optimized Thiele / Small parameters is designed to ensure high quality bass reproduction. M10 is also a magnetically shielded system, so it is safe for electronic devices. The mid-high range of Swans M10 is natural, while the low frequency is real. You can hear the difference.